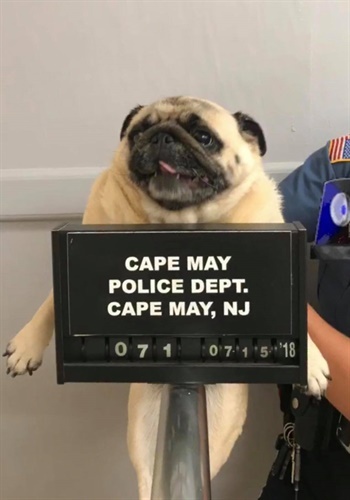 Cape May (NJ) police decided to use social media to find the owner of a lost dog they discovered on Sunday. Image courtesy of Cape May Police / Facebook. Cape May (NJ) police decided to use social media to find the owner of a lost dog they discovered on Sunday. "This is what happens when you run away from home. This guy was captured sneaking through yards on the 1300 block on New Jersey Avenue," the Facebook post said. The department added the "hashtag" #pugmug. The dog's owners collected their pet, paying "bail" in cookies as had been asked.